ATDB • View topic - When Did Computer Gearboxes Appear? When Did Computer Gearboxes Appear? The Mercedes 0405 3 speed transmission was the first I heard of with computer control. Then it was Voith from MAN SL202s from 1989 I found out has it too. Did the first ZF Ecomat series from the early 1980s have computer control or were they fitted later on and were purely mechanical? The gunzel fraternity- filled with pompous snobby know-alls. I am definitely no enthusiast of those qualities! Re: When Did Computer Gearboxes Appear? And this makes me wonder. When exactly did buses turn into computers on wheels? Were there any SL200s fitted with computers? The DGT had AEC underfloors in the 1960s with a crude form of "computer controlled" automated SCG gearbox. Scania introduced a semi-automated manual transmission in the mid 1980s. boronia wrote: The DGT had AEC underfloors in the 1960s with a crude form of "computer controlled" automated SCG gearbox. A computer afraid of kicking down and that didn't believe first gear take offs were necessary. Driver control was the better option. The "computer" was a box full of relays and air valves. Definitely had a reluctance to change down under load, buses would near come to a stand unless the driver overruled it (which seemed to have a very reluctant choice). When new the AECs started in first gear, but due to the rough change from 1 to 2, it was disconnected. Drivers were reluctant to select first unless the bus absolutely wouldn't take off on a hill, which must have done wonders for the gearboxes. The ERTs got the auto box, but I never saw a driver use one in that mode. Initially They had a centrifugal clutch, rather than a fluid fluid flywheel, which may have impacted on their operation. Flat changing is supposed to be a cardinal sin with Wilsons, yet the AEC "module" did the same thing. 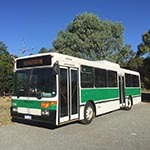 I recall in the 1990s, riding Bankstown Strathfield Bus Service AEC Swift 760 mo548 one time, the driver flat changed the SCG whole way and the gearbox survived in one piece on that trip and gave a good ride. I don't think the proprietors of Fairtown would have been pleased, however! No I don't imagine the proprietors would have been rapt with that,Swift.!! I remember going on several trips in Leopards where the drivers flat changed constantly and you were thoroughly glad to get off the bus with a nice case of whiplash !!! A driver who knew how to change the gears in line with the right revs was an absolute pleasure to ride in. The Scania CAG gearboxes in the K112TR and K92/K93 models were introduced around 1987,I think.From what I can gather good gear. I remember the drivers always starting off in second gear. Talking of hills, I used to live in Annandale and the buses on what was then the 468 were AEC Leopards as I recall. There was one difficult spot coming off the Crescent into iirc William and Rose St with both a short steep hill and a sharp turn while climbing. The Leopards would eat the hill with a load on, but when the Mercedes 0305 took over they would come to an exhausted halt on that hill and have to start off again in first gear. I don't recall what sort of transmission they had. I used to travel to high school in the 2nd series ERT Worldmasters from Willoughby. The last time I travelled in one being driven as an auto was in December 1968. That was at that time the auto function was being disabled on these buses. VIKing wrote: I used to travel to high school in the 2nd series ERT Worldmasters from Willoughby. The last time I travelled in one being driven as an auto was in December 1968. That was at that time the auto function was being disabled on these buses. Just when I think I'm on top of the ERT story, I find out a new thing I didn't know. I thought only the AEC Regal IVs had the letter 'A' in a circle standing for auto function, on the CAV gear selector. I never knew it was on the Leylands too. The poor bands must have got a hammering with the 0680 applying it's considerable pulling power during a gear change. The gearbox shop must have been constantly opening up boxes to service the bands. tonyp wrote: The Leopards would eat the hill with a load on, but when the Mercedes 0305 took over they would come to an exhausted halt on that hill and have to start off again in first gear. I don't recall what sort of transmission they had. The Sydney 0305s had a Mercedes W3D080 3 speed automatic with integral retarder and featuring lock up torque converter stage in each gear, together with low geared high acceleration diffs to better cope with hilly terrain. It had a purely mechanical hydraulic operation with no computer control. They would only down change into first gear if the bus came to a complete halt or the driver manually overrode the auto with the gear selector. This must have been designed to save on fuel and wear to the gearbox, but showed it's shortcomings on Sydney's more extreme terrain. Mercedes obviously thought better of that with their computer controlled and programmable W3E110 transmission introduced on the 0405 (STA mark V) in the late 1980s, which overcame that refusal to kick down to 1st as well as other problems associated with the older box such as violent thumping into third gear when coasting down hill. This transmissions brought new problems with the most common one being it's propensity to go into limp mode where the bus would become a single speed gearbox, taking off and staying in second gear. It sounded very much like a CVT! Both Merc transmissions, as well as ZF Ecomats also occasionally suffered what some enthusiasts refer to as "Allisonitis" where the lock up clutch in the torque convertor would fail to deploy and the engine would rev out in each gear like an old school Allison auto (more modern Allisons have lock up stages too, though the engines rev out more on take off due to low gearing). Little wonder Mercedes decided to turn to the ready made and proven ZF Ecomat series, rather than continue on with their own. Back in that era, Leyland offered the pneumocyclic box as an option in some of its truck range. One of the "advantages" touted was the ability to flat-change on hills to avoid losing momentum during gear changes. (Move selector to next gear position, momentarily release accelarator, gear changed). So perhaps this practice wasn't frowned upon by the company? Scania introduced their computer gear change back in the mid 1980s.It was called "CAG" for computer Aided Gear Change. Even though it had its benefits it also caused problems. I heard of Scania's breaking down at times.I dont think it was a popular option.And,I dont know if any Scania's had the standard ZF gearboxes fitted if a company didnt like the CAG. The CAG still required driver input, mainly in depressing the clutch to effect the actual change. It was much like driving a preselector box. If this was not done correctly, the box would neutralise, and you'd have to stop to reset it. The first examples I am aware of were a batch supplied to Kogarah Coaches which they used on their Brisbane Expo package tour program in 1988. Denv12 wrote: Scania introduced their computer gear change back in the mid 1980s.It was called "CAG" for computer Aided Gear Change. Even though it had its benefits it also caused problems. I heard of Scania's breaking down at times.I dont think it was a popular option.And,I dont know if any Scania's had the standard ZF gearboxes fitted if a company didnt like the CAG. At one point, Scania (or the operators, largely in the UK/Europe as Tasmania kept most of theirs intact) decided to change the CAG gearboxes in the N113CRB/CLB/CLL/DRB to Voiths. They then went with ZF from the mid 1990s onwards. CAG morphed into Opticruise. And other manufacturers brought out their own versions of this system. There's a setting on W 3 D and W 3 A gearboxes that permit them to shift into 1st gear at a higher speed. The setting is normally disabled to ensure a smoother ride over regular topography. This is more often than not a mechanical issue, with the valve body, clutch packs or torque converter. Even Voith gearboxes can have this problem. Bet you didn't know that Mercedes-Benz W 3 and W 4 gearboxes were actually made by ZF! I had no idea, but always wondered how Mercedes justified the cost of their own three speed transmission, and quite an impressive one at that! I just assumed they wanted their 0305 to have a noticeably better performance and efficiency edge over the competition and were prepared to go to the expense. Remember this is Mercedes we're talking about, and they presumably had big ambitions with this product. All the same, economies of scale did not make sense for a such an advanced automatic transmission that was not marketed to anyone else. They must have somehow struck a deal for ZF to develop the transmission for Mercedes exclusive use, despite ZF themselves only offering a two speed box to everyone else. It seems strange that ZF would only offer this 2 speed busmatic while making a far better transmission for Mercedes. I guess Mercedes were prepared to pay to sub contract ZF's expertise to develop their own box for them, while ZF were prepared to wait longer to release their own 3+ speed transmission for the market place, which would become there four speed Ecomat series for the 80s. PS: Was it a joint development between ZF and Mercedes Benz and ZF were then charged with building the boxes for Mercedes use? Swift wrote: Was it a joint development between ZF and Mercedes Benz and ZF were then charged with building the boxes for Mercedes use? I believe that the engineering was done in-house at Daimler-Benz with the production outsourced to ZF. Aha! That scenario makes these most sense! I'm theorising Mercedes bit the bullet after the problems experienced with their computer controlled W3E110/112 series and realised the popularity of the ZF alternative. I'm guessing the Renk Doromat was all Renk as they also engineered other propulsion systems like Voith do. Was the later 4 speed Doromat computer controlled too? Swift wrote: I'm theorising Mercedes bit the bullet after the problems experienced with their computer controlled W3E110/112 series and realised the popularity of the ZF alternative. It was interesting times up to 1991 when the last Mercedes-Benz automatic gearbox left the factory. At that stage, there were different versions for trucks and buses, with 3 or 4 forward ratios and with or without integrated retarder. By then, ZF had already introduced an automatic gearbox with 5 forward ratios for buses and 6 forward ratios for military vehicle use. What's interesting is that ZF Ecomat/EcoLife gearboxes retain the same primary retarder, right down to the hardware, as found on the W 3 E and W 4 E gearboxes. Nothing has changed in this respect over the last 30 years! To be honest, I'm not sure about Renk Doromat technology, as there isn't much documentation about them, even for those who actually own vehicles fitted with them! Going back to my OP, do you know if the earliest ZF four speed Ecomats as heard in the Adelaide sta Volvo B58s and MAN SL200s of the early eighties had a computer module controlling the changes? They sure sound like they need a computer brain to affect these gear changes! I have had the privilege to hear a recording of an MCW decker with Cummins engine in England, with this affliction in the Voith's second gear but with normal lock up on third and final gear. One of the best bus sound recordings I've heard. It would be interesting to see if this compares with my recording of the condemned to Newton MAN SL202 1640 which rarely gets to 60kph, regardless of conditions and how late it's running. Both RENK and Voith boxes 3 & 4 speed in MAN SL200s all had computers. BCC were making their own adaptations of these in the late 90's. ZF after the 2HP45's had computers as well. The 7 CAG boxed Scanias that Bayside/National had were apparently always giving trouble, even while they were being sold by Geof Philp at Bus Stop Sales and Service. They were a computer guided and aided manual shift gearbox. Maladjusted wrote: Both RENK and Voith boxes 3 & 4 speed in MAN SL200s all had computers. BCC were making their own adaptations of these in the late 90's. Is that the earliest ZF Ecomat? What was the nature of these adaptations in Brisbane? Reprogramming of some sort or fitting an aftermarket brain to their gearboxes? To answer the last question first which was about RENK and Voith boxes - the Council worked collaboratively with a couple of Uni of Qld students to develop a replacement "plug-In" unit to replace the failing computers which were also difficult and expensive to source. Back in the days when they would actually attempt to fix inherent faults. As far as I am aware Ecomat first came in the Mk1 Volvo B10M the bus I am most familiar with and yes they had a computer. The predecessor 2HP45 had only a basic system of relays, switches and trim pots in the gear selector knob.